Turkey’s tiny Christian population was grateful for Pope Francis’s Nov. 28-30 visit to their country, during which he called for an end to all forms of violent fundamentalism in the war-torn Middle East. In a Nov. 30 joint statement with Ecumenical Patriarch Bartholomew, the spiritual head of the Eastern Orthodox Church, Pope Francis said that constructive dialogue with Islam is necessary to address the grave challenges of warfare in the region, including the persecution of Iraqi and Syrian Christians. Vatican officials implied to the Associated Press in its Nov. 27 story that Francis was forced to be delicate when addressing Muslim-Christian infighting due to the diplomatic tensions between Turkey and the international coalition fighting ISIS. He did not officially meet with any refugee groups on this trip as he has done on previous trips. Also in his three previous trips to Muslim countries, Francis reached out to Muslim leaders but also politely pushed them to do more to secure the rights of non-Muslim minorities. 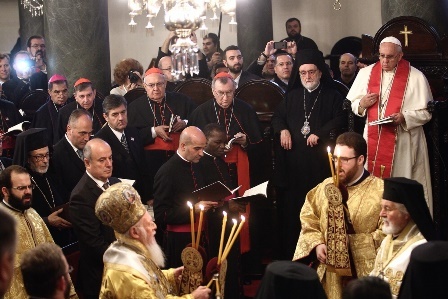 Patriarch Bartholomew has also tempered his criticism of Islamic violence against Christians. According to church officials, he and Francis did so in order to prevent violent retribution against their Orthodox or Catholic congregations in the Middle East. “I am sure that both Pope Francis and Patriarch Bartholomew make every effort to be as sensitive as possible,” John Chryssavgis, a theological advisor of Bartholomew, told World Watch Monitor. Francis denounced religious violence and the plight of Middle East refugees while in Turkey. He called on Christians and Muslims to take a united stance against terrorism. “In Syria and Iraq, particularly, terrorist violence shows no signs of abating. Prisoners and entire ethnic populations are experiencing the violation of the most basic humanitarian laws,” he said on a Friday (Nov. 28) visit to Turkish President Recep Tayyip Erdogan in the capital Ankara. Grave persecution shows no signs of slowing for minorities in the Middle East, especially for Christians and Yazidis, Francis said. However, Francis did nevertheless informally encounter a few refugees in Istanbul when he met on Sunday with 100 students educated through the Salesian Society, a Catholic religious institute that educates young and poor children. The students came from Turkey, Syria, Iraq, and African countries and were children of migrants and refugee families. He told the students that he shared their sufferings and that their situation was the “intolerable” consequence of brutal conflicts and wars. “I appeal for greater international cooperation to resolve the conflicts which are causing bloodshed in your homelands, to counter the other causes which are driving people to leave their home countries, and to improve conditions so that people may remain or return home,” he said to them. Francis had expressed interest in visiting Turkey’s southern border prior to his visit, but Turkish officials ruled this out due to security concerns. 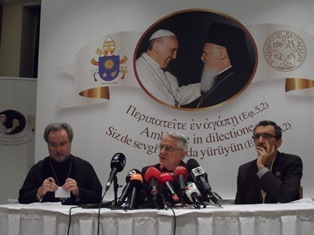 Federico Lombardi, director of the Holy See Press Office, said at a press conference that the Pope desired to meet refugees, but could not do so due to his busy schedule in Turkey. Approximately 1.5 million Syrians have fled to neighboring Turkey since the outbreak of their civil war in 2011. Over 100,000 Christians were forced out of their ancestral homes in northern Iraq this summer by ISIS. The extremist group has threatened Turkey by claiming control over large swathes of Iraq and Syria that border the country on the south. Thousands of Syrian and Iraqi Christian refugees are currently residing in Turkey. They await asylum in Europe, North America, or Australia. Francois Yakan, vicar of the Chaldean Catholic Church of Istanbul, has worked with over 55,000 refugees who have fled Iraq in recent years. He receives aid from the Turkish government and Caritas, the Catholic Relief Service. In his small office he directs aid to the hundreds of Iraqi Christians in Istanbul. Yakan appreciated Francis’s emphasis on the Middle East refugee crisis and hopes his visit to Turkey will spur more aid from Western countries. “We are grateful for his trip. God willing, his visit to Turkey will have a positive effect and result in more help for immigrants and refugees,” he told World Watch Monitor. The Chaldean vicar runs a charity known as Kader that provides food and clothing to refugees and guides the legally recognized ones through their process of obtaining resettlement abroad. He also provides critical aid to Istanbul-based Iraqi Christians who live as illegal residents in Turkey. The Turkish government allows fleeing Middle Easterners the right to aid at refugee camps. But Turkey does not consider Syrians or Iraqis full-fledged refugees with the right to aid or relocation in any other part of Turkey. Hundreds of Iraqi Christians live in Istanbul’s Kurtulus neighborhood, a working-class area where Greek and Armenian churches still exist. Most live in unheated apartments with barely enough money to pay for food or electricity. Men spend their day at coffee shops, playing cards or watching Iraqi football matches on satellite channels. 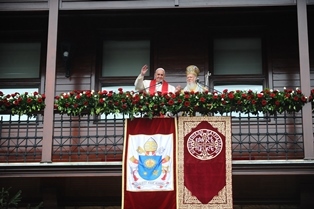 Francis came to Turkey over a three-day period from November 28 to 30. The official reason for the Pope’s visit was to celebrate the Feast of St. Andrew, the patron saint of the Greek Orthodox Church, with Patriarch Bartholomew. Bartholomew himself has struggled for broader religious freedoms in Turkey over recent decades. Turkey’s authorities only consider him the leader of the Muslim-majority nation’s tiny community of 3,000 Greek Orthodox Christians. They have denied his requests to reopen the Patriarch’s seminary on the island of Heybeliada, south of Istanbul. It has been closed since 1971. The patriarch has enjoyed a close friendship with the Pope. 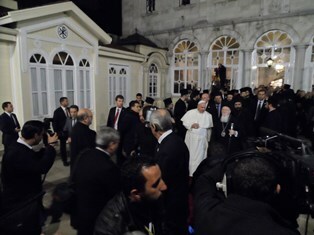 While Francis didnot publicly call for the re-opening of the seminary, he offered “moral support to the patriarch’s problems and challenges,” Chryssavgis told World Watch Monitor. Turkey’s Muslim leadership has denied any persecution of its religious minorities. Mehmet Gormez, the leader of Turkey’s Directorate of Religious Affairs, denounced religious extremism in a Nov. 28 meeting with Francis. He claimed that the Islamic country was an ancient land that provided for the freedom of religion for all people. But Gormez admitted that many refugees – both Christian and Muslim – had fled the Middle East for reasons of war. Far too many who attempted to flee to Greece with the help of human smugglers had washed ashore dead in Turkey when the boats crossing the Aegean sank.